'Baahubali (Bahubali) 2' release date: Why was SS Rajamouli-Prabhas' film postponed? Director SS Rajamouli has denied the reports that the release date of "Baahubali (Bahubali) 2," starring Prabhas and Rana Daggubati, was postponed. The makers of director SS Rajamouli's "Baahubali (Bahubali) 2" have postponed the release date of its second instalment, which was initially slated to hit the screens on April 14, 2017. But the reason is not clear. Leading critic and trade expert Taran Adarsh had revealed earlier this year "Baahubali: The Conclusion" would hit the screens on 14 April 2017, which happens to be the Good Friday holiday. He had tweeted on Mar 2: "Breaking News: #Baahubali2 release date finalized: 14 April 2017 [Good Friday]. SS Rajamouli directs. Expect a Hurricane at the BO. Why did Katappa kill Baahubali? We will get the answers only next year now [14 April 2017]. #Baahubali2 #EagerlyAwaited (sic)"
The movie buffs across the globe marked this date as an official release date for "Baahubali 2," starring Prabhas and Rana Daggubati. Even many media houses reported it as an official release date of "Baahubali: The Conclusion." Producer Shobu Yarlagadda made an announcement that he has once again teamed up with Karan Johar for its Hindi version. Shobu Yarlagadda â€tweeted on Aug. 5: "We are very happy to associate again with @karanjohar @DharmaMovies & Anil Thadani of AA films for the Hindi release of @BaahubaliMovie 2." Later, he announced its release date on the official Twitter account of "Baahubali." He tweeted: "April 28th 2017!! #Baahubali2." Bollywood producer Karan Johar also tweeted: "Dharma Productions and AA films are honored and proud to associate once again with the genius @ssrajamouli 's vision. 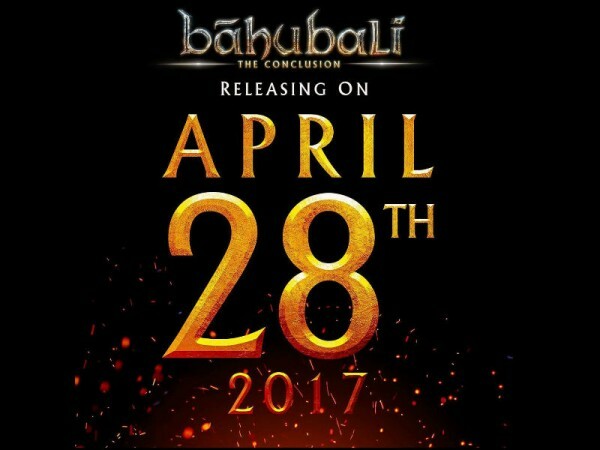 @BaahubaliMovie The Conclusion releases on the 28th of April 2017 @arkamediaworks @Shobu_ #Prasad @dharmamovies." However, this announcement fuelled the speculation about the postponement the release of "Baahubali 2." But in a statement to International Business Times, India, Mahesh S Koneru, the publicist for "Baahubali," denied the reports about its postponement. "April 14, 2017 was not an official announcement. So official release date as confirmed by Team as well as Karan Johar is April 28, 2017," the PRO told IBTimes India.